This is my November ladybug! I actually thought that it was dead but it started moving around and came to the edge of this leaf! We had a rain snow mixture today! Wasn't expecting to still be taking ladybug pictures this time of year. Fantastic focus and love the way you composed the picture. 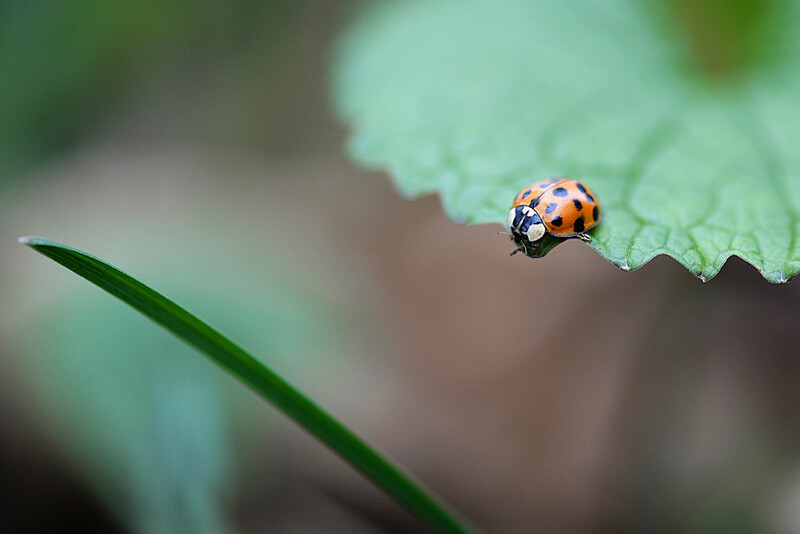 It is quite the surprise to find a ladybug out hiking around this time of year. I can find them if I dig around in the leaves at the base of trees but they obviously don't want to be disturb from the late fall slumber. Amazing macro. Love your composition and how you caught the little ladybug snuggled into one of the ruffles on the leaf's edge. I've not seen a ladybug in months. What a wonderful find. Love the way its orangey-red looks on that green leaf, too.